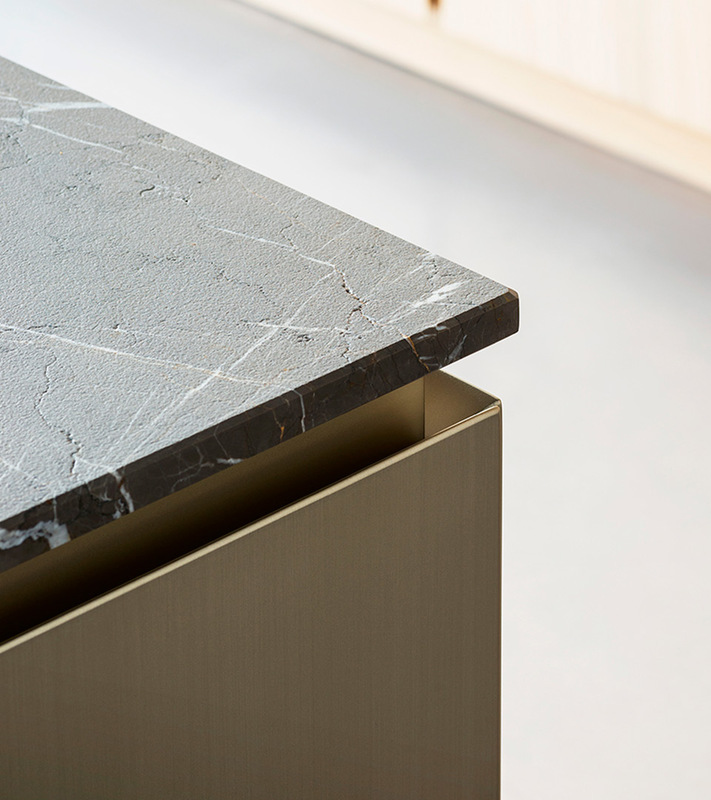 Carefully selected, natural materials matched to original finishes and details. The design quality allows creating a unique style, in harmony with the space. A large island becomes the hub of the home life. A sough-for and designed naturalness able to confer a balanced personality to the space in its essence and most intimate materials. A solution suitable for open spaces, for architectures characterised by new identities and living dimensions. The T45 model used in this composition allows for utmost compositional versatility and freedom in choosing finishes. T45 is presented in its main configuration: one composition of island and columns. 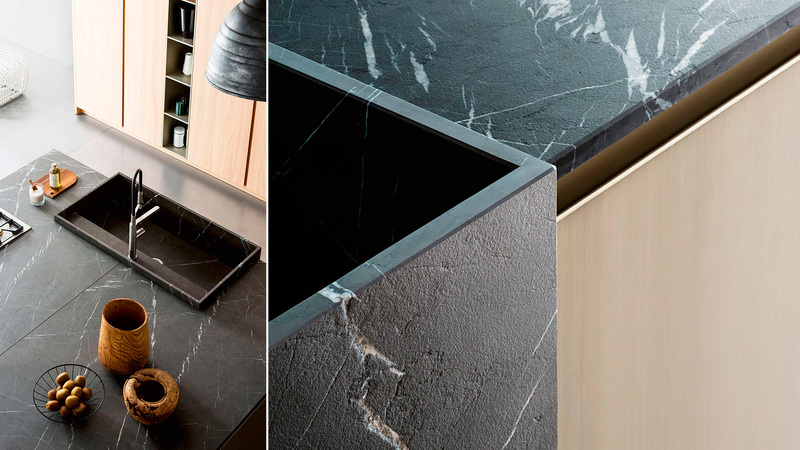 The large top in pietra di Corinto features hub and sink overhanging from the top. 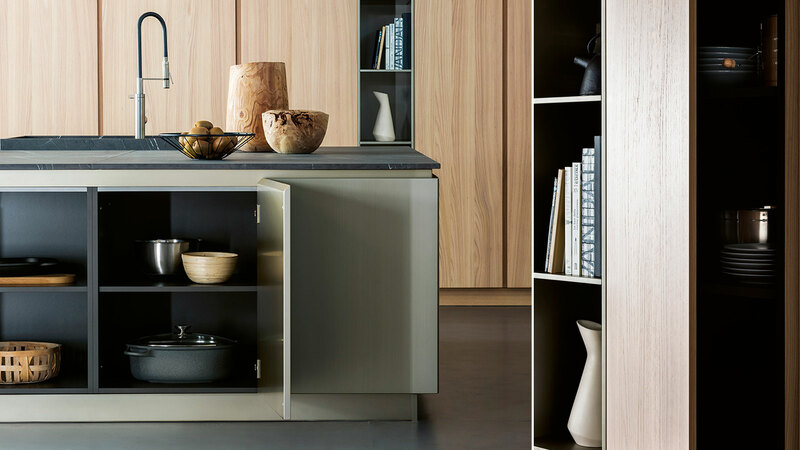 The bases are equipped with pantry compartments with extractable hinged doors and T45 lacquered effetto metallico finitura Champagne doors. Same finish for all the plinths and visible compartments. The doors of the columns are the T45 model with vertical cut, in vertical-flame olmo sbiancato, grain-coupled all over the composition to allow vein continuity. The central column features door with retractable mechanism, allowing to use the ovens and leave clearance. The large island dominates the environment. 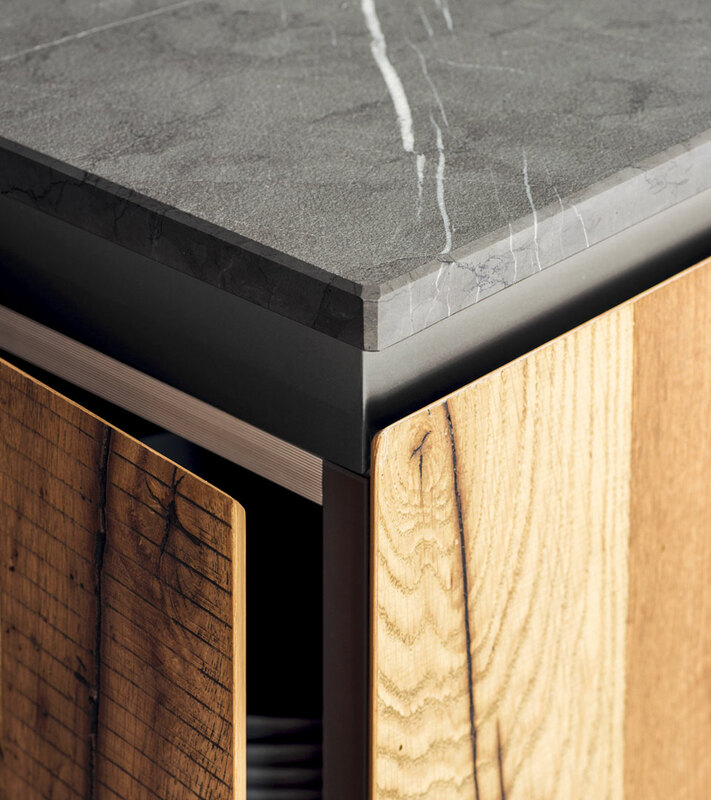 The 20 mm thick worktop in pietra di Corinto macrata is raised compared to the doors, with a structure in coloured solid wood: a detail of the T45 line that allows for a high range of customisations and great formal neatness. Tailor-made details that exalt the sough-for essentiality of the composition. A ceiling built-in hood is installed above the hob. 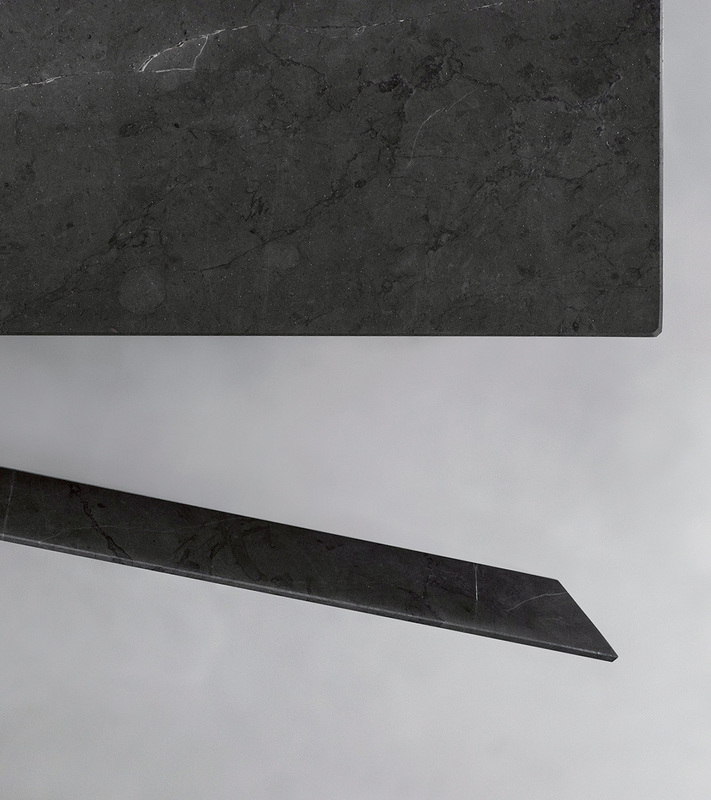 The pietra di Corinto macrata on the entire surface exalts the natural porosity of the material. 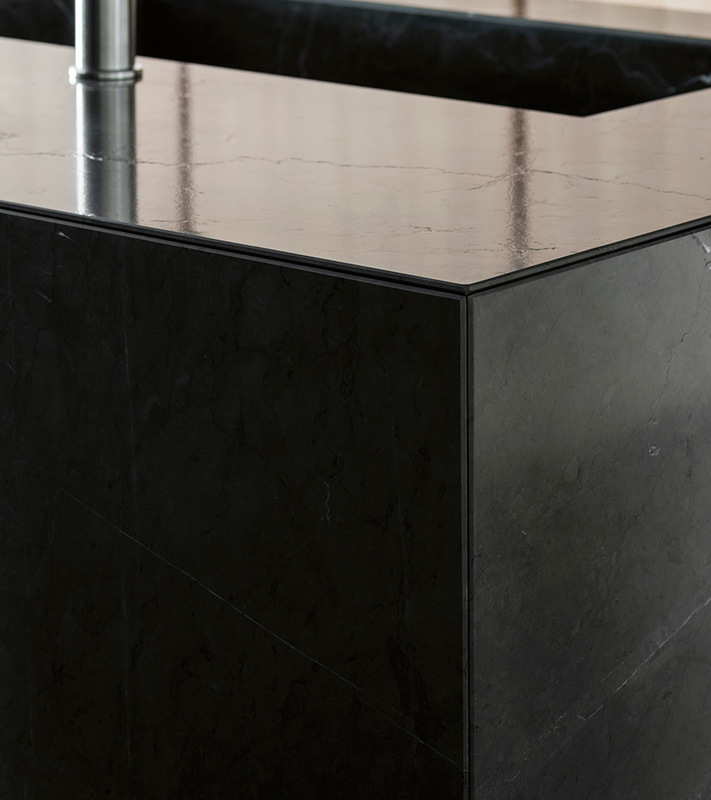 It is polished and tapered on the edges like the interior of the sink assembled according to drawing, improving water drainage and facilitating cleaning. The accurate 45 degrees cuts allow to render the joints almost invisible and create extremely refined details. 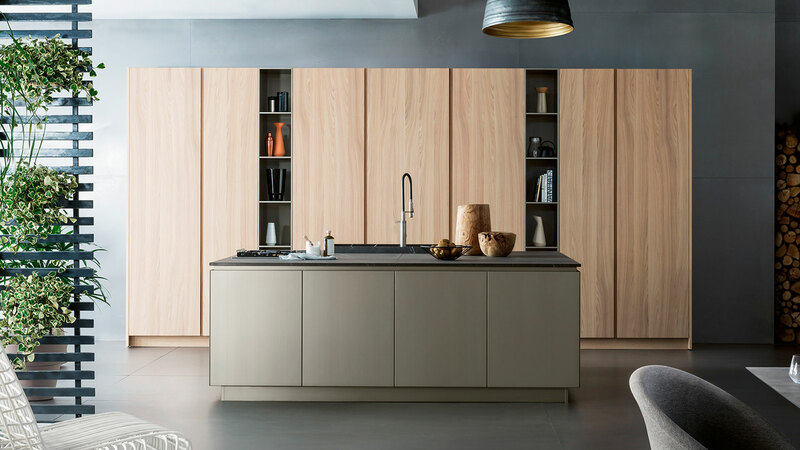 Modular kitchen system. Doors and fronts may be 22 mm or 28 mm thick. ∙ T45: doors and fronts have an edge with an inclination of 45° which, sticking out of the structure, creates an opening grip. The remaining edges are straight. 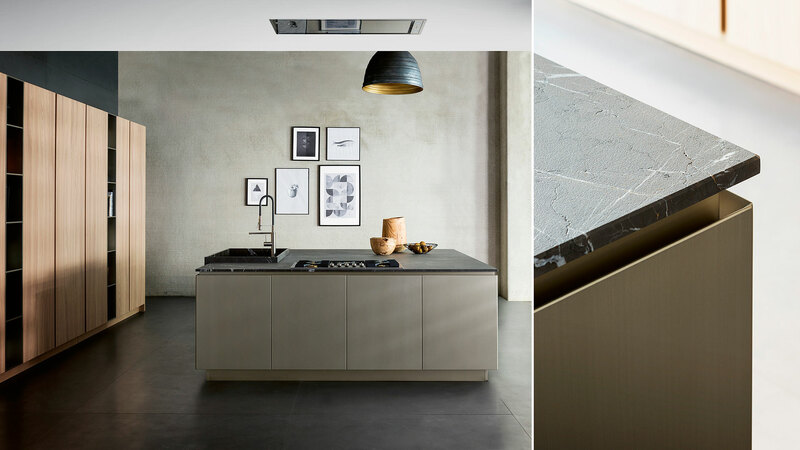 ∙ T45 Evo: doors and fronts have an edge with an inclination of 45° which stick out of the structure and is in contact with the worktop.